Colonel Jason S. Wieman grew up in a military family and was commissioned in the Army after graduating from the United States Military Academy at West Point in 1991. His first assignment was at the Uniformed Services University of the Health Sciences where he earned his medical degree in 1995. After completing his internship at Eisenhower Army Medical Center he was assigned as a flight surgeon with the 1st of the 7th Cavalry Regiment at Ft. Hood, Texas. He deployed as the Task Force Surgeon for Intrinsic Action 1997-2001 during this assignment. From there, he returned to EAMC and completed a residency in Family Medicine. 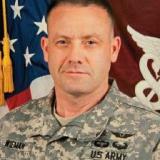 He returned to the 1st Cavalry Division as a flight surgeon from 2000 until the summer of 2002 when he attended a second residency in Preventive Medicine at Madigan Army Medical Center and completed a Masters Degree in Public Health at the University of Washington where he assumed the duties of the Chief Resident of the program. Col. Wieman next served as the USASOC Preventive Medicine Physician and deployed in support of Operation Iraqi Freedom (OIF). He returned to the 1st Cavalry Division again and served as the Division Surgeon during OIF 2006- 2008, during “the Surge” operation in Baghdad, Iraq. Upon return from OIF he was assigned as the Group Surgeon for the 1st Special Forces Group (Airborne). His next assignment was to the Army War College where he served as a fellow to the Department of Health and Human Services as a Senior Project Manager for the Task Force, creator and publisher of the first National Health Security Strategy. He commanded the 421st Multifunctional Medical Battalion at Wiesbaden, subsequently assuming duties as Medical Director, Wiesbaden Army Health Clinic. Col. Wieman most recently served as the Commander of the Weed Army Community Hospital at Fort Irwin, Calif.
Col. Wieman’s military awards include the Bronze Star Medal, Meritorious Service Medal (three awards), Joint Service Commendation Medal, Army Commendation Medal with V Device, Army Commendation Medal (four awards), Army Achievement Medal, Armed Forces Expeditionary Medal, Humanitarian Service Medal, Airborne, Air Assault, Flight Surgeon Badge, Dive Medical Officer Badge, the Expert Field Medical Badge, the Order of Military Medical Merit and he is a member of the Order of St. George. He is board certified in Family Medicine, Preventive Medicine and a trained military acupuncturist. He is a graduate of the Army Medical Department Officer Advanced Course, the Command and General Staff College and the Army War College. Check out the incredible speaker line-up to see who will be joining Jaosn.